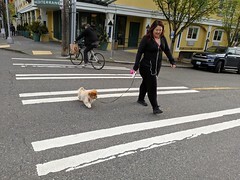 March 2-4, 2019: Sub base repairs + concrete pour as we make pedestrian improvements at the intersection of S Myrtle St & Beacon Ave S.
Swift Ave S, S Myrtle St, and S Othello are two-way arterials serving south Seattle. The streets link Holly Park and Beacon Hill to Interstate 5 (I-5). Our goal is to improve the safety, accessibility, and comfort for all users. From March 2-4, 2019, we’re finishing up our sub base repairs to the ground for a concrete pour as we make pedestrian improvements at the intersection of S Myrtle St and Beacon Ave S.
Starting on 7 AM on Saturday, March 2, we will be demolishing concrete on Swift Ave S. This will be followed by a concrete pour as soon as 5 PM and complete by 2 AM. The road will remain closed Sunday to allow the concrete to cure. We’ll return Monday at 12 AM to place temporary asphalt over the road panels. Traffic will return to normal by Monday, March 4 at 6 AM. Northbound lanes on Swift Ave S between S Eddy St and Beacon Ave S will be closed. Traffic will be detoured to S Graham St via Beacon Ave S. Traffic will return to normal by Monday, March 4 at 6 AM. Please follow marked pedestrian detours. King County Metro route 107 will be rerouted. For information on changes to King County Metro stops, please visit kingcounty.gov/metro/alerts. Swift Ave S, S Myrtle St, and S Othello are two-way arterials serving south Seattle. The streets link Holly Park and Beacon Hill to Interstate 5 (I-5). Our goal is to improve the safety, accessibility, and comfort for all users. We’re repaving about 1.75 miles of Swift Ave S, S Myrtle St, and S Othello between S Albro Pl and Martin Luther King Jr Way S. As part of the repaving, we will be taking off the old top layer of the road, placing new asphalt and repainting the lane lines. In addition to repaving, we’ll also be improving the existing bike lane along Swift Ave S / S Myrtle St between S Albro Pl and Martin Luther King Jr Way S by making it wider. 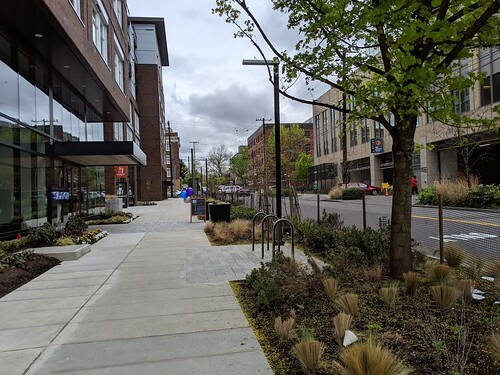 There will be some parking consolidation along S Myrtle St east of Beacon Ave S.
For more information on this project, please visit our project page. If you have questions or concerns, please contact the construction outreach team at swiftmyrtleothello@seattle.gov, or 206.256.5227. Thanks for your patience as we make these safety improvements. 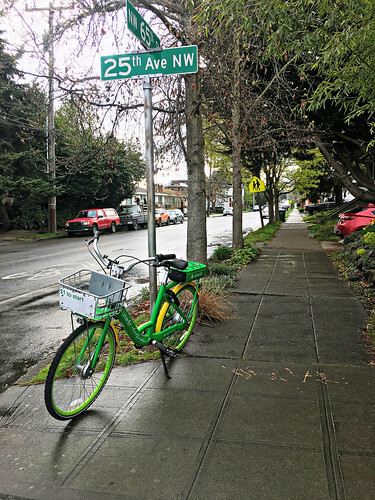 Wed, Feb 27: Local Access Only along 23rd Ave S between S Massachusetts St & S Jackson St. This Wednesday, from 9 AM to 3 PM, we’ll be pouring the center lane on 23rd Ave S between S Dearborn St and S Lane St. What this means for you is that when we pour, 23rd Ave S between S Massachusetts St and S Jackson St will be local access only. This means that people who live, work, play, or shop on or near 23rd Ave S in this stretch can continue to do so. All other through traffic will be detoured to Martin Luther King Jr Way S. See below for details. Thanks again for your patience! What does Local Access Only mean? 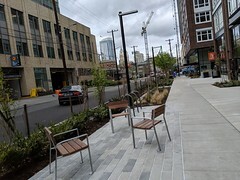 If you live, work, shop, or play on or near 23rd Ave S between S Massachusetts St and S Jackson St, you will still be able to get to your destination. Please let the flagger know where you are going and they’ll get you there. Note, travel times may be longer. If you are passing through the area going north on 23rd Ave S, you will be detoured to Martin Luther King Jr Way S.
What does this work mean for your driveway? During the pour, all driveways between S Dearborn St and S Lane St will be not be accessible. If you live on the west side of the street in this stretch, we’re advising you to move your car before 7am on Wednesday and not use your driveway until after 5pm. If you live on the east side of the street, you should be receiving notification to move your car to a side street and plan to return Friday morning. The reason for this extended closure is because we have to form the new lane on Tuesday, pour it on Wednesday, and then the new concrete needs time to set (harden) on Thursday. What else should you expect? There will be a slight bump in side street traffic on Wednesday. We are placing NO PARKS on S Lane St between 23rd Ave S and 24th Ave S to keep local traffic moving. Expect traffic to be slower than normal in this area. 23rd Ave Corridor Project update: S Judkins St reopens this afternoon! S Judkins St reopens this afternoon. Thank you all for your patience! We’re making progress on the 23rd Ave Corridor Project. We plan on reopening the east and west sides of the 23rd Ave S and S Judkins St intersection this afternoon before the evening commute. As you know, we recently put conduit in along S Judkins St. We needed to pour back the trenches and were able to do that while school was out and there was a break in the weather. There’s more work to do at this intersection so stay tuned. But for now, you can drive across 23rd Ave S at S Judkins St.
Don’t forget! This is what we’re doing. 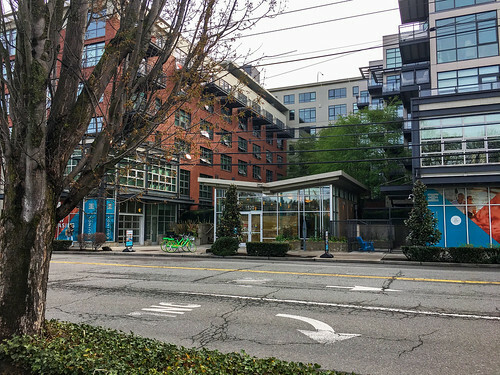 Local access only along 23rd Ave S potentially happening next week. The contractor still needs to do a center lane pour between S Dearborn and S Lane streets. They would like to do it next week either on Tuesday, Wednesday, or Thursday. This to say, the pour depends on the weather so we’re keeping an eye on the forecast as it develops and will keep you updated on our plans. What this means for you is that when they pour, 23rd Ave S between S Massachusetts St and S Jackson St will be local access only. This means that people who live, work, play, or shop on or near 23rd Ave S in this stretch can continue to do so. All other through traffic will be detoured to Martin Luther King Jr Way S. If they pour, they’ll do it between the hours of 9 AM and 3 PM. See the map below for how to get around during this time. Thanks again for your patience! COMING SOON: Construction will begin for new sidewalks & speed humps on NE 50th St.
Construction will begin as early as February 25th or as late as March 4th and when it does, NE 50th St will be open to local traffic only until construction completes in May of this year. This project is a result of significant neighborhood support to make NE 50th St more comfortable and walkable for pedestrians. 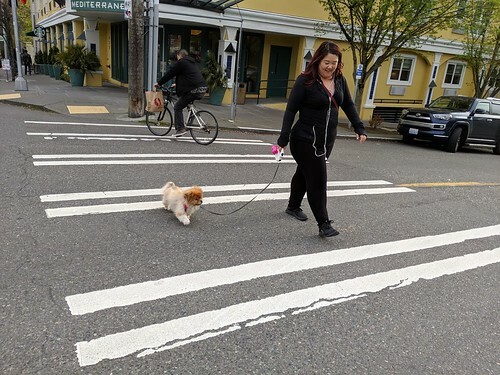 To provide a more comfortable and separate space for people walking on NE 50th St, we’re installing new curbed sidewalks on the south side of the street between 30th and 33rd avenues NE, with curb ramps at each corner. Five speed humps will also be constructed throughout NE 50th St to reduce driving speeds and make it more walkable. Construction will begin late February, early March 2019. Crews will work between 7 AM and 5 PM on weekdays. Construction will be complete and NE 50th St will be open again by the end of May 2019. The NE 50th St sidewalk project is weather-dependent, and the project schedule is subject to change. NE 50th St will be closed, except to residents and local businesses on NE 50th St. Parking will not be allowed on NE 50th St during construction, and temporary driveway closures will occur when work is happening next to or in front of driveways. 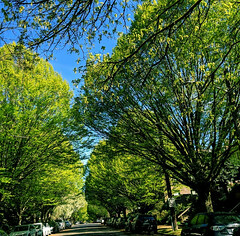 Adjacent streets, such as 30th Ave NE, and the residential streets, such as University View Place NE, will be open during project construction. Expect loud noise, dust, and typical construction equipment while crews are working. For more information on this project, please our project website. If you have questions or concerns, please contact our outreach team by emailing amber.berg@seattle.gov or calling 206.684.5283. Thanks for your patience while make these improvements! Image credit: Chun Kwan. SR 99 Alaskan Way Viaduct 2019. Looking north. Preparing for more changes to traffic patterns downtown. The Battery Street closing for good. Planning ahead for the Aurora Ave N detour and construction impacts. Temporary parking restrictions and uniformed police officers – keeping transit and emergency responders moving. Lane changes – be prepared for changes to your commute. We’re almost there! When the new SR 99 tunnel opens, which is on schedule to open before the morning commute Monday, February 4, traffic patterns will change as travelers encounter this new tunnel and new route options. This will affect everyone who travels to and through downtown Seattle, even if you’re not using the tunnel! WSDOT’s website for the new SR 99 tunnel, www.99tunnel.com, is your best resource for learning all about the new tunnel. Watch these videos that show you how to use the new tunnel and how connections to downtown will be different. Check it out! 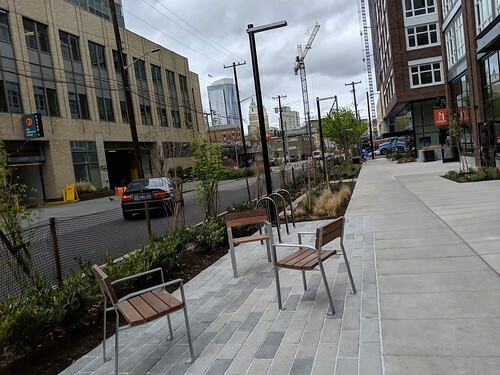 Read on to learn about some upcoming street changes and actions we’re taking to keep people and goods moving safely, including reconfiguring key streets and restricting parking downtown. 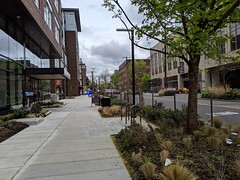 This photo shows the three streets – Harrison, Thomas, and John – that will be reconnected as part of the #Realign99 work. The Battery Street Tunnel will close for good at 10 PM on Friday, February 1. The tunnel is vulnerable to earthquakes, just like the Alaskan Way Viaduct (it’s over 60 years old! ), and continuing to use it for any purpose would cost lots of money in restorations and repairs. Additionally, closing the Battery Street Tunnel allows us to “reconnect” streets at the north end of the tunnel that was previously cut off by the approach to the tunnel. 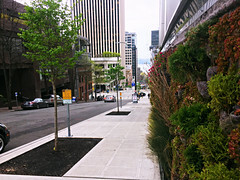 Over the next year and a half, John Street and Thomas Street will be reconnected, and Aurora Avenue North rebuilt between Harrison Street and Denny Way. Learn more about the project here! Plan ahead: Aurora Ave N detour and construction impacts. Traffic Detours: Between Friday, February 1 at 10 PM and the opening of the new SR 99 tunnel, traffic will be detoured off of Aurora Ave N at Valley Street. Please note that 5th Ave N will be closed for Saturday’s Tunnel to Viaduct 8K Run/Walk from 7 AM until the end of the event. Please be aware of these changes to traffic and plan ahead if you’ll be heading either northbound or southbound on Aurora Ave N.
Temporary parking restrictions and uniformed police officers – Keeping transit and emergency responders moving! During the #Realign99 closure, we restricted parking in key locations and placed uniformed police officers at specific intersections to keep traffic moving and to make room for transit and emergency responders. Since traffic patterns will again be changing when the tunnel opens, we are continuing to restrict parking and keep UPOs in certain locations to maintain that capacity. The parking restrictions will continue from February 4 for up to two weeks. The parking restrictions are from 6 AM to 7 PM, Monday – Friday. The uniformed police officer locations are also in place Monday-Friday and will be stationed during the peak morning and evening commute periods: 6 – 10 AM, and 3 – 7 PM. Tunnel is open, single NB off-ramp near stadiums still closed. 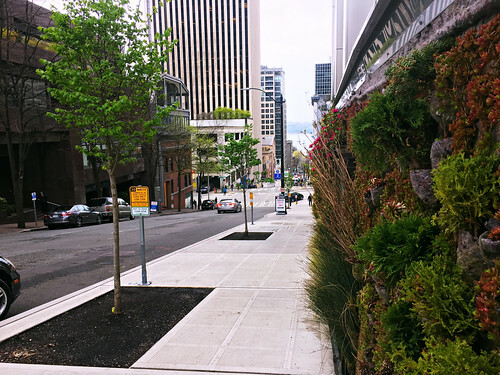 We reconfigured lanes around downtown to make space for transit and freight vehicles during the Realign 99 closure. This included a temporary bus-only lane on the Spokane St Viaduct and 4thAve S. This bus lane will remain in place until the new northbound SR 99 off-ramp to S. Dearborn St opens, which will open about one week after the new SR 99 tunnel opens. We also installed freight and transit-only lane on Alaskan Way during the closure, which will be removed this weekend between February 2 – 3. Visit King County Metro’s Get Ready site to view bus routes once the new tunnel opens. We are striping a bus-only lane on Cherry St between 1stand 3rd Ave to keep transit moving eastbound once the S Dearborn St northbound off-ramp from SR 99 is in place. Now that buses will not be traveling on the Alaskan Way Viaduct, this dedicated bus lane allows these bus lines to keep people moving quickly and efficiently through downtown. This work is scheduled to occur the weekend of February 9 – 10 at the latest but may occur during the week of February 4 to ensure that crews have good weather to restripe this lane. If work occurs over the weekend, it will begin at 5 AM. If work occurs during a weekday, work will begin at 3 AM to be completed before the peak morning commute period begins at 6 AM. Work will take up to two hours and impacts to traffic will be minimal. These changes are going to make travel times more reliable and help keep people moving during this time of increased traffic. By installing temporary and permanent changes to Seattle’s streets, we will keep transit and vehicle travel reliable and improve our emergency response times as responders address incidents downtown. On-street parking options downtown will be limited. People, businesses, schools, manufacturers, and many others rely on the timely delivery of products and goods, and we want to ensure they move as predictably and efficiently as possible. If you need to drive, plan ahead and be prepared for your new route and parking locations downtown. 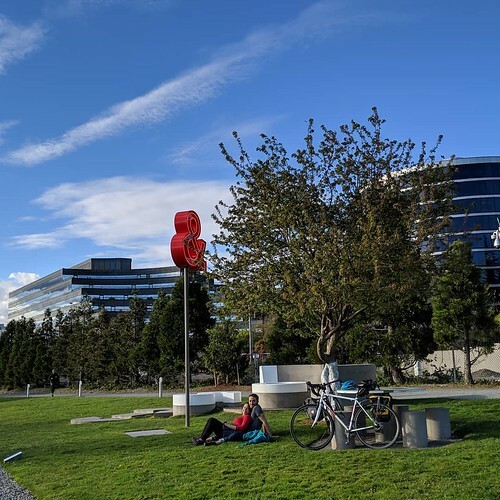 Use the Seattle Parking Map to make a plan before you leave. Keep our Vision Zero goal in mind, follow the rules, take a deep breath and travel safely. This is a great time to try a new commute! Try transit, biking, walking, carpooling or vanpools. 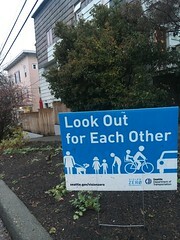 View our Tools page at www.seattle.gov/traffic for helpful resources. We recognize the impacts that parking restrictions can have on local businesses, and we’re here to provide support during this time. We’ll closely monitor our downtown streets to confirm traffic is moving smoothly and adjust as needed. If you have any concerns, please contact our Customer Care Center team at 684-ROAD@seattle.gov or call (206) 684-ROAD. We’re working hard to make sure we’re keeping people and goods moving safely and efficiently, and we appreciate your patience and understanding as we all adjust to this new normal. Notice of future impacts related to the closure of SR 99 and other projects impacting traffic during the Seattle Squeeze are posted to our blog at www.seattle.gov/traffic. Monday, Feb 4: We’re closing the west side of the 23rd Ave S & S Judkins St intersection. We’re placing conduit. Here’s what you can expect. As the initial closure of the east side of the intersection wraps up, we’ll be moving to the west side of the 23rd Ave S and S Judkins St intersection on Monday, February 4. We will be digging a trenching across the intersection to place conduit. Once the conduit is in, we will back-fill the hole. We will need to close that side of the intersection at least one more time to pour the permanent concrete. Please expect this first closure to last about one to two weeks. Why do you keep the west side of the intersection open? One question we continue to hear is, why can’t we keep the west side of the intersection open? The short answer is there isn’t enough room for the workers to work and cars to go by. It’s not safe for you as a motorist and it’s not safe for our contractors. The good news is that the closure is temporary and there are alternate routes to get in and out of the west side of the neighborhood (see map below). We appreciate your patience. If you have any questions, please send an email to 23rdAveCorridor@Seattle.gov. The east side of the 23rd Ave S and S Judkins St intersection will be closed for the next week. On January 29, we closed the east side of the 23rd Ave S and S Judkins St intersection and expect this initial closure to last about a week. We’re digging a trench across S Judkins St so to place conduit. Once we’re done trenching, we will temporarily patch the hole and reopen that side of the intersection. We’ll return to the east side of the intersection in about 2 weeks to pour the road back. Please expect another east side closure at that time. West side closure expected as soon as next week. Close the west side of the 23rd Ave S and S Judkins St intersection. Do similar work on the west side as we’re doing on the east side. Trench across S Judkins St, back-fill it and then pour the road back. Expect a similar closure timeline for the west side. See below for the west side closure mailer that’s going to about 1400 neighbors in the area this week. The view from above #Realign99. Image credit: Chun Kwan. Sunset on our beautiful city. Also pictured the SR 99 Alaskan Way Viaduct 2019. Aerial images captured by one of our own. This picture of the fading sunlight over Seattle’s cityscape seems appropriate for us as we sunset a part of Seattle’s history (#GoodbyeViaduct, we will miss you) and prepare for the present/future (hello, #99Tunnel) in the coming days. This is truly a new season of thriving changes for our beautiful city and we wanted to pay tribute by pictures to a structure that helped people and goods get to and through Seattle for the last 65 years-ish. One of our colleagues, Chun Kwan, apparently moonlights as a stellar drone photographer 😉 JK, Chun, JK. He captured these photos to help document the history at play here, and in doing so, remind us (not that we need the reminder) of the beautiful place we call home. Image credit: Chun Kwan. SR 99 Alaskan Way Viaduct 2019. Chun has been into photography for the past 15+ years, starting with point and shoots, working his way up to large DSLRs, and using a drone to take the amazing photos highlighted in this post. His work life is inundated with data that he and others at here use to make good decisions. And while he often pre-plans his photo shoots using data and weather forecasts, he says that when it comes to photography, sometimes the best opportunities can present themselves spontaneously. 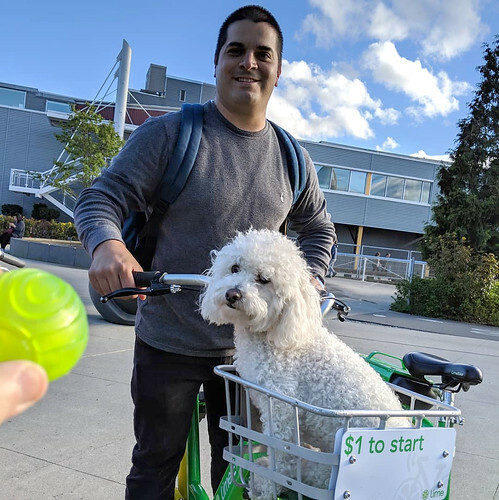 FYI, Chun’s been getting to and from work before and during the #SeattleSqueeze via transit (not drone). #GoodbyeViaduct, hello waterfront and #99Tunnel! Now that you’ve seen all these awesome overhead shots, imagine what this view will look like (from above, and more importantly, from street level) once the viaduct comes down and the reimagined waterfront takes shape. The struggle (of the Squeeze) is real. Making it through the construction and disruptions over the next several years will be challenging, but over the past few weeks, we’ve seen what regional teamwork can do – people made changes and those changes added up. Keep it up and let’s not forget the amazing changes yet to come. For additional tools, tips, and resources about the #SeattleSqueeze, visit our website! Northbound deck of the SR 99 tunnel. Photo courtesy of WSDOT. 2 weeks down, 1 to go until the new SR #99Tunnel opens! We’re almost there! Crews are completing the final work needed to realign the SR 99 highway into the new tunnel below downtown Seattle. We’re so grateful to everyone who changed their commute during this time – these two weeks have proved that when we work together, we can keep traffic volumes low and spirits high. (We don’t want you to stop using the #MyCommuteWasAwesome hashtag, by the way! If you can continue to change your commute, please do.) Keep it up – we’re almost there. Heading into the light at the end of the tunnel. Photo from 2014, courtesy of WSDOT. However, it’s not “back to normal” when the #99tunnel opens. Instead of getting right back on the Alaskan Way Viaduct with downtown exits and Belltown and SODO entrances, we’ll be driving through the new SR 99 tunnel straight from the stadiums to the Space Needle. This is going to be different, especially for folks in the SODO and South Lake Union neighborhoods, where the tunnel’s north and south portals will transfer drivers to Seattle’s surface streets. It’s time to get ready. 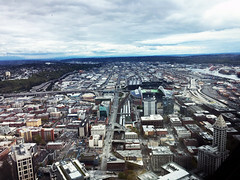 Click this photo to view the map of the new SR 99 Tunnel. Traffic patterns will change again, as travelers get used to these changes and their new routes. This will affect everyone who travels to and through downtown Seattle, even if you’re not using the tunnel! Duration: approximately 1-2 weeks. Tunnel is open, single NB off-ramp near stadiums still closed. Photo courtesy of WSDOT. Tunnel entrances & exits have changed. The tunnel entrances and exits are in South Lake Union and SODO, which is different than how travelers used to access the viaduct. 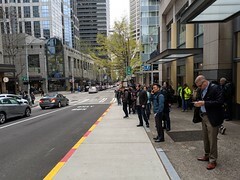 We’re expecting more vehicles in these areas near the new tunnel portals and fewer vehicles in the parts of downtown which no longer connect to SR 99 (such as Seneca and Columbia streets). Watch the ‘how to’ navigate the new tunnel videos. WSDOT’s website for the new SR 99 tunnel, www.99tunnel.com, is your best resource for learning all about the new tunnel. Watch these videos that show you how to use the new tunnel and how connections to downtown will be different. (Videos also available in Spanish and Chinese – Mandarin and Cantonese.) Check it out! Know about construction still underway. 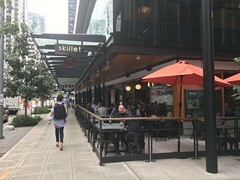 When the tunnel opens, a key connection to downtown – the northbound off-ramp to Alaskan Way/downtown near the stadiums – will still be under construction. Travelers going northbound toward downtown will either need to choose another route or plan to drive through the tunnel to South Lake Union. Just like the #Realign99 highway closure, we’ve been planning and preparing for the #99Tunnel opening for a long time. We’re here to make sure our transportation system functions well in order to keep people and goods moving safely and efficiently. Our Transportation Operations Center (TOC) staff are working 24/7 to monitor our transportation system. We’re tracking traffic patterns through signal technology to move as many people as safely and as quickly as possible through busy intersections. 24/7 Transportation Operations Center continues. Our Transportation Operations Center (TOC) will continue to operate 24/7 to monitor traffic across the city and implement changes as needed. 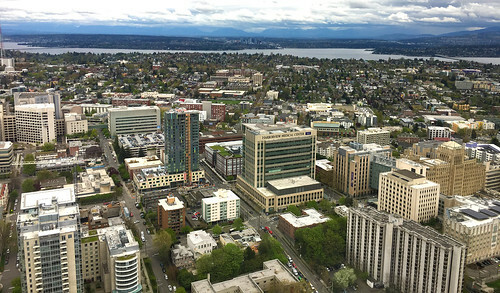 If incidents arise, they work with our partner agencies at WSDOT, King County Metro, Sound Transit, the Port of Seattle, Seattle Police Department, and Seattle Fire Department to ensure a coordinated and rapid response to clear the situation quickly and safely. Dynamic messaging signs on key streets. We use dynamic messaging signs (DMS) on key streets in and around downtown to alert travelers of immediate concerns and provide notice in case incidents arise and alternative routes are needed. Don’t worry – we’re in this together! It’s time to make your plan. We’ll be releasing more information about how to get around when the tunnel opens later this week, and our friends at WSDOT are providing updates on their website and social media as well. Now’s the time to prepare. Make a plan, know your route, and if you can, keep up those alternate commutes! Taking alternate modes of transportation or shifting your commute times will continue to be great travel options even after the tunnel opens. Our city is transforming. It’s all going to be worth it. 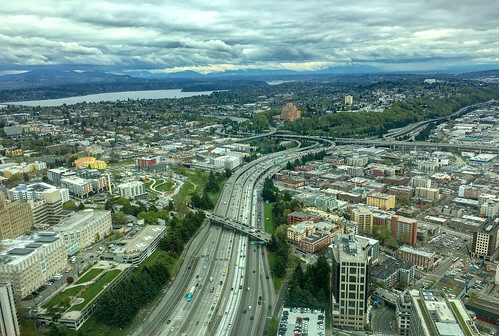 Although we’ve made it through the #Realign99 closure, this is just the beginning of the #SeattleSqueeze, Seattle’s new era of tough traffic over the next five years. We are going to continue to be “squeezed” as construction projects and changes to our infrastructure change how we all get around. Stay patient and flexible and make a plan before you go. 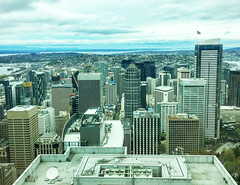 Visit our website, www.seattle.gov/traffic, for the latest information and the tools you need to get around. Keep it up, Seattle – we’re truly making lemonade from lemons! Stay tuned for more information about using the tunnel, navigating to and from the tunnel’s north and south portals, and the City’s response to these changing traffic patterns. For now, plan ahead, visit www.99tunnel.com, and keep on keepin’ on – you’re doing great! 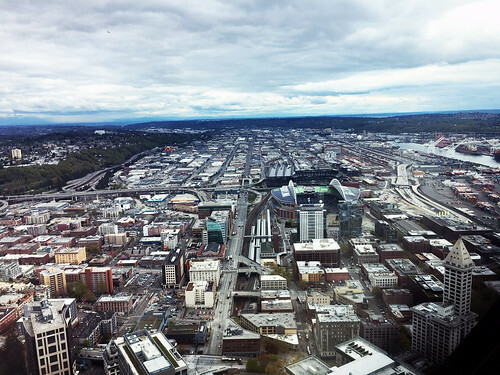 Keep up with all things #SeattleSqueeze. Visit our website!